September 30, 2009 by Ken Ward Jr. The West Virginia Blue blog had a piece the other day called, Blankenship Loves Him Some Frivolous Lawsuits, reporting on Massey Energy’s civil suits against mountaintop removal protesters. And now, Associated Press correspondent Vicki Smith has more on this issue. Massey did not immediately comment on its cases Wednesday, but court filings suggest the protesters are having a measurable, if minor, impact on the bottom line: In one lawsuit, Massey claims a single action — the 31/2-hour occupation of a dragline at Progress Coal’s Twilight mine June 18 — cost the company $300,000. Earlier this year, Raleigh County Circuit Judge Robert Burnside issued a restraining order against some of the protesters, and last week, he held six in contempt for repeatedly defying that order. Burnside’s Sept. 24 ruling, which is temporarily stayed, orders protesters to pay Massey more than $19,000 in attorney fees and expenses, plus $500 fines per person. 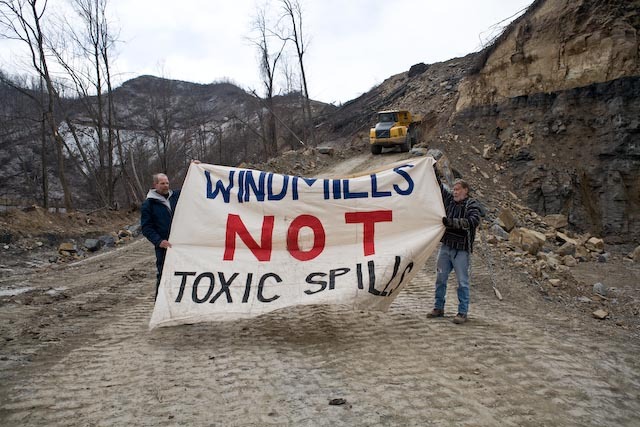 MORGANTOWN, W.Va. — The fight over mountaintop removal mining in southern West Virginia’s coalfields has expanded to a second front — the courtroom. Virginia-based Massey Energy has filed three lawsuits so far this year against environmental activists who have staged more than a dozen acts of civil disobedience designed to pressure the nation’s fourth-largest coal company to abandon the destructive form of strip mining. The protesters are mainly affiliated with Climate Ground Zero, based in Rock Creek. The most recent lawsuit targets two who brought blasting to a halt in August by spending six days in treetop platforms at Massey’s Edwight mine in Raleigh County, as well as two ground-support people. One Climate Ground Zero activist was on trial Wednesday for a separate action against Patriot Coal in May. Glen Collins, who chained himself to a giant dump truck on Kayford Mountain, was being tried in Boone County Magistrate Court on charges of trespassing and conspiracy. He could face 18 months in jail if convicted. Mountaintop mining is a highly efficient but destructive practice that involves blasting away ridge tops to expose multiple coal seams. Massey, which operates mines in West Virginia, Kentucky and Virginia, contends it’s the only way to reach some of the coal it wants. Opponents say it forever disfigures the land, damages the environment and causes both physical harm and property damage to people who live near the sites. Massey subsidiary Alex Energy Inc. first sued protesters in February after three demonstrations — one at the Bee Tree surface mine and two at Edwight. Independence Coal Co., another Massey subsidiary, sued in June after the dragline occupation that Massey claims forced it to temporarily idle 187 workers. That lawsuit, which calls the activists’ actions “publicity stunts,” also refers to a May 23 action in which two protesters donned hazardous material suits and rowed a canoe into the nearly 9 million-gallon Brushy Fork sludge dam at Marfork Coal Co. near Whitesville. The order covers Collins, Antrim Caskey, James G. McGuinness, Rory McIlmoil, Mike Roselle and Chad Stevens. Roselle is a co-founder of Earth First! and the Rainforest Action Network, while McIlmoil is a community organizer for Coal River Mountain Watch and McGuinness is a veteran activist. Updated: A bit of a correction I’m going to append here to Vicki’s story — she listed all of the defendants named in the suit. But the judge’s contempt order does not apply to ALL of them. The protesters who were found in contempt were: Antrim Caskey, Jordan Freeman, Madeline Gardner, Charles Suggs, and William Wickham. I’ve posted a copy of the contempt order here. Caskey argued she was working as an independent journalist and should be exempt from the restraining order, but Burnside said no such privilege exists under state law. Charleston attorney Roger Forman, who is representing the protesters, said he will take the case to the state Supreme Court if Burnside ultimately requires his clients to pay. “It’s just plain wrong,” he said, accusing the judge of issuing an overly broad restraining order. In his answer to Massey’s last lawsuit, Forman claims the coal company’s employees wrongly seized photography equipment and other personal possessions, including a cell phone, from Kurt D. Mann of Asheville, N.C., and Paul C. Brown of Fayetteville. That “interfered with their ability to pursue their living as photojournalists and have cost them lost earnings,” the filing says. When they put Glen Collins in prison that should bring in a few hundred if not a few thousands activists to sit on Massey’s mountaintop removal toxic nightmares. Massey would be better off financially if they encouraged Congress to outlaw mountaintop removal. No jail time was assessed, though. Instead, Magistrate Charles M. Byrneside fined Collins a total of $2,901 for both counts, including court costs and jurors’ service fees.